Экспериментальный трехместный самолет Levasseur PL 3, построенный в 1924 году, стал первым проектом Левассера, на котором он применил фюзеляж-лодку, позволявший совершить посадку на воду в случае аварии. Машина унаследовала сбрасываемое шасси от своего предшественника ДальшеMore>>> и получила крыло со значительным поперечным V, придавшим ей характерный вид. Построенный в 1926 году PL 4, трехместный разведчик-корректировщик (класс A.3/R.3b), получил новое крыло. В 1928 году была заказана серия из 39 машин, и еще девять построили в 1929 году. Самолеты поступили в эскадрилью 7R1 (позднее 7S1) морской авиации на авианосце "Беарн" и его учебную группу на аэродроме Хиерес-Паливестре под Тулоном. PL 4 был оснащен двигателем Lorraine 12Eb в 450 л.с. (336 кВт) и при размахе крыла 14,60 м и максимальной взлетной массе 2640 кг (у серийных машин) развивал скорость 178 км/ч. Вооружение состояло из одного 7,7-мм пулемета. The second machine shown was a fleet spotter of unusual construction, at any rate as regards its fuselage. At the previous Paris Aero Show, it may be remembered, a three-seater touring machine was exhibited in which the rear portion of the fuselage was formed by two long narrow panels of multi-ply wood. The fleet spotter may be said to be a development of that machine as regards its fuselage construction which takes the form of four panels made up from a number of layers of wood glued together and suitably triangulated so as to avoid the necessity for any wire bracing in the sides. The rear portion of the fuselage is formed by two panels, and the front portion, including the undercarriage vees, of another two, the structure being completed by half-a-dozen transverse struts with wire bracing. One objection to this form of construction is that in case of damage to a part an entire panel will have to be renewed. On the other hand, the construction is so absurdly cheap that this fact alone should entitle it to consideration. The panels are not glued up of solid sheets, cut out afterwards, but the various vertical and diagonal struts are joined to the longerons much in the same manner in which the blades of a propeller are joined by overlapping the laminations. One of our sketches should make the principle clear. The various panels are joined together by large steel plates and bolts, and as the taper is everywhere straight, the cross bracing joining the two sides together is simplicity itself. The machine is to be covered with three-ply so as to make it watertight, as it is intended for use over the sea, although not fitted with floats. The engine mounting, carrying a 370 h.p. Lorraine-Dietrich engine, is of steel tubing, and forms an entirely separate unit. 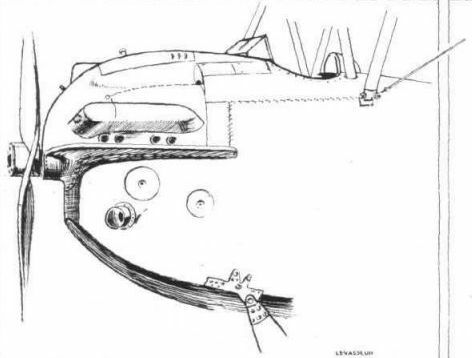 As already mentioned, the undercarriage vees are formed as integral parts of the front side-panels, a feature which might be objected to on the score that damage to the undercarriage would necessitate the renewal of the whole panel. 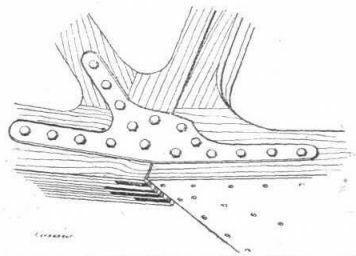 The axle is housed in an open slot in the bottom of the vees, and an arrangement is to be incorporated by means of which the axle and wheels may be dropped preparatory to alighting in the sea alongside the aircraft carrier, should this become necessary for any reason. The wings are of ordinary design, with two pairs of interplane struts on each side, and do not call for any special comment. The top plane is in two halves, which attach to a cabane resting on, but built as a separate unit from, the front panels of the fuselage. The fuselage construction of the Levasseur fleet spotter should be especially useful for cheap low-power sporting and touring machines, especially as we are informed that the structure is extremely light without the three-ply covering, which might well, for ordinary use, be replaced by fabric. For gliders also this form of construction would appear to have much to recommend it, especially the absence of metal fittings, or at any rate their reduction to a minimum. Thus for amateur construction the "panel system" would have the advantage of both cheapness and easy manipulation. THE firm of Pierre Levasseur, which is one of the largest contractors of aircraft to the French Navy, will exhibit at the Salon the following machines: (a) a three-seater shipboard reconnaissance aeroplane, with 450 h.p. Lorraine-Dietrich engine; (b) a two-seater fighter, with 500 h.p. Hispano-Suiza engine; (c) a transport aeroplane, with 420 h.p. Gnome-Rhone Jupiter engine. In addition, there will be found on the Levasseur stand wooden and metal propellers of various types, including the Levasseur-Reed duralumin airscrew, for which this firm is sole licensee for France. The Levasseur Shipboard Reconnaissance Aeroplane.- The Levasseur shipboard reconnaissance aeroplane belongs to the class of naval aircraft which are designated in France under the term avion marin, which does not mean, as some suppose, a seaplane, but rather a seagoing aeroplane. The avions marins of the French Navy are used both for shipboard and coastal service, in the carrying out of which work they may have to alight in an emergency on water. For this purpose the lower portion of the fuselage is built in the form of a sturdy water-tight hull, fitted with a step; when the pilot has to alight on water, he merely releases the undercarriage and locks the airscrew in horizontal position; the machine can then come to rest without any danger of nosing over, and will float indefinitely. Wing-tip floats contribute to the hydrodynamic stability of the machine. The wings are timber framed and fabric covered, while the fuselage is mainly built of plywood over two longitudinal main frames, which are joined by a bottom and a top of plywood. This type of construction does away with all wire bracing, and insures absolute water-tightness. The engine mounting is built of steel tubing. The wings may be folded for stowage on board aircraft carriers. Specification of the Levasseur Shipboard Reconnaissance Aeroplane.- Engine, 450 h.p. Lorraine-Dietrich; span, 14-60 m. (open), 5-67 m. (folded); length, 9-70 m.; height, 3-91 m.; wing area, 60 sq. m.; weight, empty, 1,550 kg. ; fuel load, 310 kg. ; useful load, 540 kg. ; weight, loaded, 2,400 kg. ; max. speed, sea level, 185 km.p.h. ; speed at 3,000 m. altitude, 175 km.p.h. ; climb to 3,000 m. altitude, 20 mins. ; ceiling, 5,500 m.
The Levasseur 7T. Transport Aeroplane.- The Levasseur 7T. Transport Aeroplane, with a 420 h.p. Gnome-Rhone Jupiter engine, is a single-bay tractor biplane of simple but sturdy construction. The type of construction is similar to that employed on the two machines described above. The wings may be folded for stowage. The cabin is spacious, and accommodates six passengers in very comfortable seats. The pilot's cockpit is situated right behind the engine and ahead of the wings, thus giving the pilot a maximum of visual range. Behind the pilot's cockpit there is a navigation room which is equipped with wireless telephony. Specification.- Engine, 420 h.p. Gnome-Rhone Jupiter; span, 14-50 m. (open), 5-67 (folded); length, 10 m.; height, 3-85 m.; wing area, 60 sq. m.; weight, empty, 1,550 kg. ; fuel load, 300 kg. ; useful load, 850 kg. ; weight, loaded, 2,700 kg. ; max. speed, sea level, 180 km.p.h. OF the three machines exhibited by P. Levasseur one was a three-seater naval reconnaissance machine, of the type originated by this firm in which the undercarriage can be dropped, the fuselage being watertight, and the machine being steadied when floating on the sea by two small wing-tip floats. For this operation the propeller is locked by a special mechanism in a horizontal position, so as to prevent any tendency for the machine to nose over. The machine exhibited was generally similar to machines of this type shown at previous Paris exhibitions. In some ways perhaps the most interesting of the Levasseur machines was the limousine type VII.T, fitted with Jupiter engine. This machine had a very spacious and well-appointed cabin with seating accommodation for six passengers. The fuselage construction of the VII.T is of the type originated by this firm some years ago, in which the main structure consists of two fore and aft members forming Warren girders. These members are of multi-ply construction, the joints between longerons and struts being formed by overlapping the laminations rather in the manner familiar from the construction of laminated wood air screws. It is claimed that this construction is very economical as regards strength for weight, and that it is very cheap to make and keeps its shape remarkably well in service. In the case of the VII.T cabin machine, this form of construction has the further advantage of making possible an entirely unrestricted cabin space. The actual machine exhibited had its cabin portion finished in the form of a Weymann body, which looked remarkably well. How it will withstand the wear and tear of commercial flying in all weathers remains to be seen. A notable feature of the VII.T was that its tail surfaces were of ample proportions, and certainly very much larger than those found on the majority of French machines. 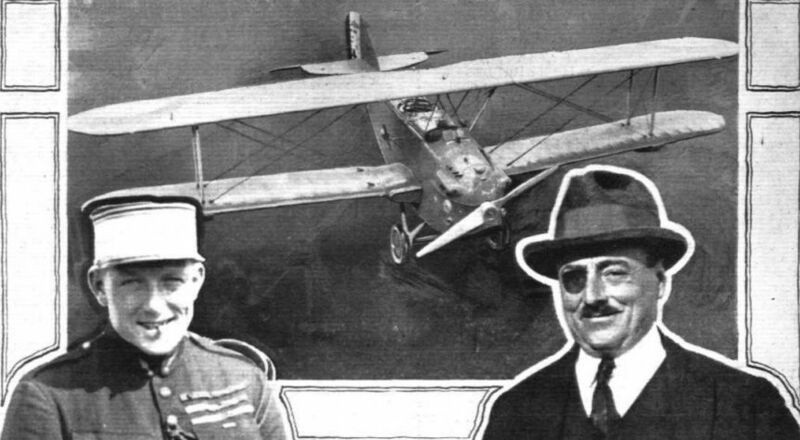 Perhaps this may be explained by the fact that M. Charles Frechet, the firm's Managing Director, spent a goodly portion of the war years in the British Air Board, and that he has ever since been keeping in very close touch with British aviation progress. It is notable that British machines have, generally speaking, considerably larger control surfaces than those of foreign nations, and in consequence are much more manoeuvrable at angles near, or even above, the stalling speed. The Levasseur VII.T should certainly share with British machines this manoeuvrability and altogether looks a very promising commercial aeroplane. With a fuel load of 660 lbs. this machine has a pay load of 1,870 lbs., which appears to be a very useful commercial proposition. Этот Levasseur PL 4 с выпущенным посадочным крюком только что зацепился за тормозной трос на палубе французского авианосца "Беарн" (введен в строй в 1927 году). The P. Levasseur three-seater naval reconnaissance aeroplane is fitted with "droppable" undercarriage, water-tight fuselage and wing tip floats. 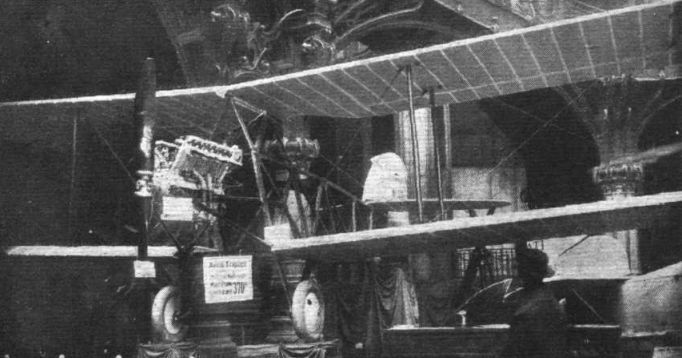 THE PARIS - NEW YORK FLIGHT: Our Photograph shows the P. Levasseur "Avion Marin" three-seater exhibited at the last Paris Aero Show. The actual machine used was somewhat modified to take larger tanks, and the front cockpit removed. The insets show: Left, Captain Nungesser; and, right, Captain Coli. The P. Levasseur three-seater naval reconnaissance aeroplane has a detachable undercarriage and a watertight fuselage. The Pierre Levasseur Navy Type: This machine has a very unusual fuselage construction, consisting of a few panels of multiply wood, and should be extremely cheap to build. 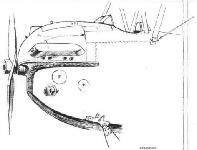 THE PIERRE LEVASSEUR NAVY TYPE: Diagrammatic sketch showing panel construction of the fuselage. THE PIERRE LEVASSEUR NAVY TYPE: Detail sketch showing method of multi-ply construction of the panels. The nose of the "Avion Marin," showing skids intended to prevent machine from nosing over on alighting on the water. The P. Levasseur 7.T Limousine with "Jupiter" Engine.